Total Built-Up Area - 1459 Sq.ft. 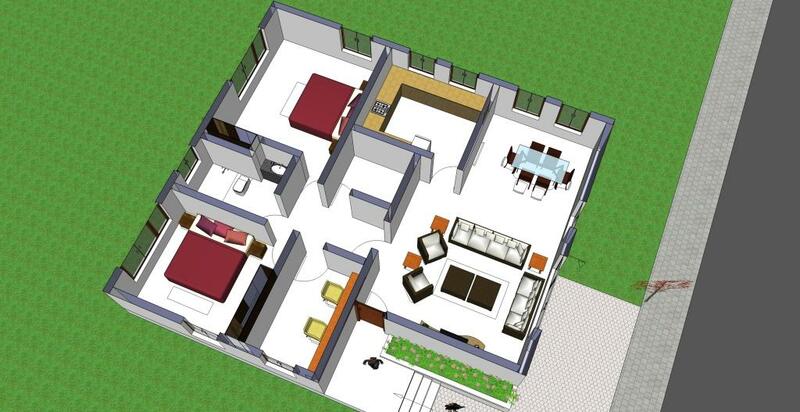 This 40 x 40 ft house will best suit a corner plot which is more of a square in shape. The entrance to the living room goes through the elaborate entrance lobby which flanks a suitably placed flower bed next to the living rooms wall to create point of interest at arrival. The massive living room extending itself till the dining area is flanked with a large kitchen space on to the left of it. This compact ground floor house has another wing which separates’ itself from the family entertainment space to their private habitable space, which has two bedrooms. A common toilet is shared amongst the two bedrooms and the study is which doesn’t have an external wall surface for a window opening, but a skylight is what gives it its most deserved natural light and ventilation. The central space of the house is the passage which leads to all the other rooms. The mild slopes and conjunction of the roofs create interests for the elevation of the house and makes it a appealing feature for this home design.